When posting a new topic, instructors have the option to set a topic type. The default topic type is normal. Students (participants) can only post “normal” topics. Instructors can also post “sticky” (anchored), “announcement,” and “reusable” topics. Announcement: most important – appears at the very top of the topic list. If more than one, appears in chronological order (newest on top). Sticky: important – appears under announcements, but above tasks and normal posts. Normal: all student posts are normal. They appear in chronological order under one of the other topic types. I’ll Re-use: Reusable topics are those that you want to be copied with “Import from site” when you port your content over from term to term and with IMS Import / Export. Be sure to check topics that you plan to re-use from term to term! 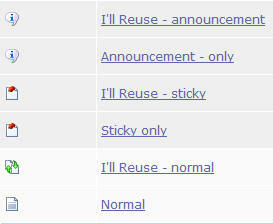 Reusable topics are listed below announcement and sticky topics, but above normal topics. Reusable + announcement topics are listed above announcement topics. Likewise, reusable + sticky topics are listed above plain sticky topics. Normal topics are listed in chronological order, with the most recent discussion topics at the top, so that class members can see easily the newest contributions. However, you can force topics to be above others, depending on the topic type.